Abstract Cognac is the debut ep from L.A's The Kraken. 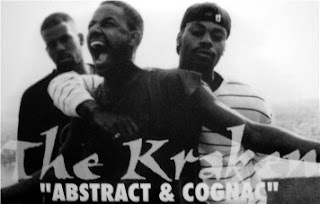 Comprised of members Pyro, Able-1 and Sirus, the Kraken didn't release a lot of music and that's probably why they didn't get the credit they deserved. As a group the only other release I know of is The Dusty Subliminal Rhymes Ep﻿ released on Goodvibe Recordings in 1998. I've heard rumours of some unreleased music floating around the tape trading scene, but i've never been able to track any of it down. Thanks for the linkage brother!